Gingery Rice & Giveaway Winners! Have you ever found yourself wondering, “What the heck am I going to do with this sweet potato?” (Come on, I know you have.) My answer is usually some kind of soup or stew with an African flair and peanut ingredients. But when I’m in the mood for something a little different, I go to the cookbooks I haven’t used in a while and look for fresh ideas. This is, in fact, what I did with the first half of the sweet potato I used in yesterday’s lunch. Having overbought during the last sweet potato sale, I found myself with an extra potato in need of using. But, lover of sweet potatoes that I am, I wasn’t about to complain. 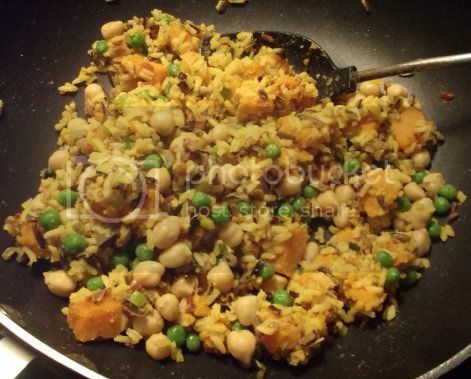 Vegan Express turned out to have a neat recipe for ginger- and curry-spiced rice with sweet potatoes and peas. 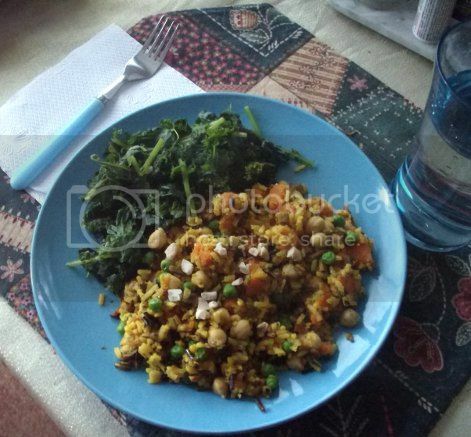 All it needed was some kind of protein to make it a full meal, so I dumped in some chickpeas. You really can’t go wrong with chickpeas in an Indian-style dish. Between the sweet potatoes, the peas, and some turmeric, this turned out to be a nicely colorful dish. It was easy, too, which I’ve come to expect from the recipes in Vegan Express. For the rice part, I used the Rice Selects blend I’ve been sort of obsessed with lately because of its nutty flavor and the fact that it doesn’t take toolong to cook. It also has multiple colors of light and dark rice in it, which made the whole thing look even nicer! A few cashews for garnish, some kale on the side, and suddenly this quick dish was a winning meal. Zippy fresh ginger plus nutty rice plus sweet starchy potatoes equals one happy vegan.